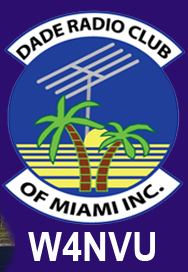 July 2012 Meeting Minutes – W4NVU – Dade Radio Club of Miami Inc.
Miguel presided over the meeting and welcomed everyone. The meeting was not broadcast live on the air tonight from the EOC. Everyone took turns and stated their name and call sign. Miguel welcomed everyone again. Miguel congratulated Frank as being officially authorized by ARRL at a PIO officer. Congratulations Frank! The minutes from last month’s meeting were posted online. A motion was made by Frank, and seconded by Kent, and accepted as posted. Corporate Secretary is not present tonight due to work. Treasurer’s Report – Esther gave the treasurer’s report and we have 55 paid members. Website – Ryan advised that he has posted the MS1 pictures on the website and all of the minutes are posted as well. Nothing else. Club Elmer/PIO Officer is Frank. He has badges for sale for the club and needs a few more so that he can put in the order. They are only $10.00 each. Please see Frank. He advised that the attended an ARRL round table in Palm Beach and they had various work groups. He received assess to parts of the website so that he can obtain free literature for the club and has a list of resources that will be beneficial to the club as well. There is going to be another meeting in about 2 weeks to explain what is actually available. Dave had no testing tonight. Miguel announced that Steve in the process of trying to get an ambulance from AMR for the club. He needs the club’s filing status. Dave advised that we were a 501C34 at one time. We need to file something every year to keep current and we can file online. There was discussion about the need for insurance, qualifications, if we could possible register the vehicle with the County, etc. Esther needs to figure out how much work needs to be done and she will look into it. We will discuss it further next month. Miguel announced that he, Frank, Ryan and Steve attended the ARRL town hall meeting. He attended the club section and met some other people from other clubs. There were workshops for PIO, DXing classes. The next meeting will be close to Ft. Myers and Miguel will send out an email for those that are interested in attending. He also announced that the first weekend in October will be an emergency test. More info will passed on when received. The next Hamfest is in Ft. Pierce on August 11th. Milton, Florida, also has one on July 205h. Miguel also announced that Armando just finished a very successful class with all 11 passing. Congratulations Armando – great job! Armando is also the one that did the artwork for the club banner. Miguel held it up for those to see. It was used at field day. It will be displaced t all our events forward. The individual repeater reports were skipped tonight. Field day was discussed. Miguel thanked Ryan and Frank. Our site was flooded and the group transferred to the Everglades site. Everyone had a good time. He asked the park for a credit because we were rained out and they gave us a credit. It was discussed of having a picnic in October. He needs someone to take it over if we are going to have a picnic. Frank advised that someone suggested at the ARRL meeting that we could use a parking garage for our next field day. Some places will give you permission and if it rains, you have some shelter. Ray warned that you still need to watch out for lightning. Esther also said that they can create a waterfall effect too. Miguel said it was a good idea and we need someone to take over for field day next year. Dave is still working on a location for the D-star repeater. The place he is contacting has some issues. He will keep us updated. Miguel has the club shirts if anyone wants to buy one. They are $20.00 each and he believes that white is the only color left. Miguel announced that the American Radio Club is having a get together on July 15 at Tropical Park – pavilion 7. He said that we should go out and have a good time. There will be Latin style food and they only want a little donation for food. He announced that we should all check the SoFLHams.com website for updated information. Miguel announced that besides us there are other clubs and people on the Reflector. It is not a good idea to post negative comments. We need to promote Ham radio in a positive way and asked for the cooperation of those involved. Ray asked if anyone knew the club that was adopted by the Town of West Miami. It was brought up that it could be the American Radio Club. He advised that all of their antennas that were on the building are gone. Someone announced that they are still taking check-ins. Miguel announced that Hamfest is near. Some people have made reservations. Frank is going to send out a blast email. At the town hall meeting, a guy from Ft. Pierce told Miguel that our club hit a positive note with vendors. That he heard that they were excited and coming to Miami for our Hamfest. Tom announced that we still need a few people for Hamfest. Kent volunteered to help out with security. The ARRL liaison is Frank. The onsite RV’s is Frank Sullivan. The tickets will be handled by Ester, the treasurer. Tom said that the Expo gave us the ticket booth without a charge. There are also bucket drops that he believes are included. Ray warned him to make sure. Tom said that he did receive an itemization upfront from them and the contract is in writing. Dave and Mike will be in charge of testing. Tom asked about Forums. It was discussed that we could have Forums after the morning session of testing. Testing could be from 8:00 AM to 11: 00 AM. He only booked one room for the testing and forum. Thursday is set-up. Different rooms and their uses were discussed. Robert suggested that Tom might want to invite the Florida Repeater Council to have a meeting during the Hamfest as we could possible get more people to attend. Dave reminded Tom that we are going to need a raffle barrel. Virgil stated that SFDXA is going to present a Forum and they will check cards also. Miguel suggested that we come up with a Kid’s Corner at the Hamfest. __________ volunteered. Armando suggested a Fox Hunt and nationwide “Make Your Fair”? Miguel asked Esther to find a place to get the tickets made online. He did find a place that would make 10,000 tickets cheap, but we need to give them the artwork and what numbers we want to use. The members discussed the tickets. Robert said that he believes that he has some old tickets scanned in and the will check and get back to the club. Dave brought up the hanging parking passes in two different colors. Miguel stated that he never did a Hamfest before and is getting ideas as we go along. Miguel said he would find a company. Wrist bands were also discussed. A video presentation was shown to the members present on new digital radios, etc. that are coming out. There was a lot of discussion among the members. Tom asked if anyone has signed up for the Forum committee of the Hamfest and the answer was no. Tom asked about scheduling future meetings for Hamfest. Ray suggested to hold them either before or after our meetings since everyone should be present. Miguel also brought up the business (board) meetings – we are having one on August 11 and another one in October. We are having business (board) meetings every other month. He will send out a blast email. Another presentation was shown to the members present from Ham Radio Now. Miguel announced that next year we need an official to show up at Field Day so that we can earn an extra 100 points. The DRC meeting was cut off.